Electronic Kit School. - SCRs are electronic component which are served as the switching devices for the unusual DC to DC converter that is suited for the everpresent 5V USB power source and also other applications. This novel power circuit topology uses an intermediate resonant link that facilitates self-commutation for both SCRs – while SCRs are easy to turn on, they tend to be difficult to turn off in DC applications. 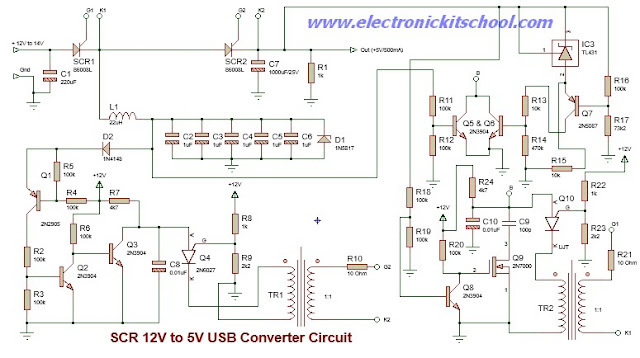 In this article we will show you one electronic circuit that will give you SCR DC to DC Converter 12V to 5V USB Circuit like in Figure 1 below. 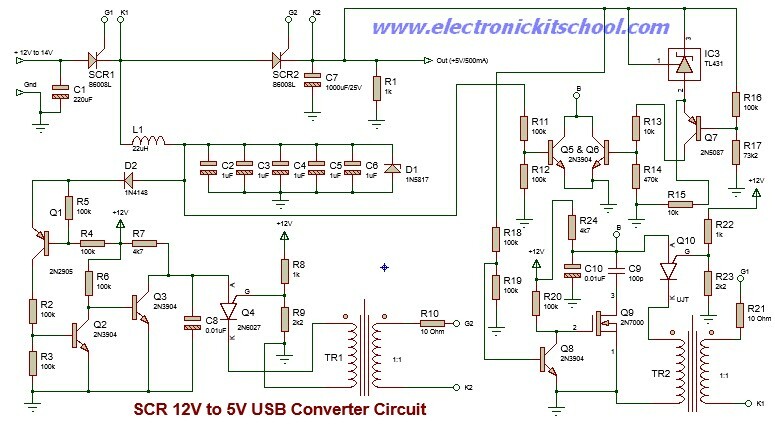 Circuit like in Figure 1 above show you about the SCR DC to DC Converter 12V to 5V USB Circuit. According Electroschematics site describe that this circuit has some specification for us as follow. For firing SCR1, the minimum delay time is a function of the charging of C10 –this delay is extended by the effect of the voltage regulator. IC3 is the TI TL431 adjustable shunt voltage reference that is strapped for minimum (2.5V). Q7 compares this reference voltage to the feedback voltage through the feedback voltage divider that consists of R16 & 17. Q6 both inverts the feedback signal and references it to common potential so that it may shunt C10. Q5 turns on when there is voltage across the capacitor network –it essentially tells the firing circuit that the capacitor network is empty and needs a new charge. Q5 & 6 also form an AND function so that both conditions must be satisfied before C10 is allowed to charge. When C10 charges to approx 8.6V,Q10 fires and triggers SCR1. SCR1 subsequently charges the capacitor network and does not stop at 12V because at that point the inductor is fully charged and must keep conducting until the capacitor network voltage reaches approx 24V. When the voltage across the power supply output reaches 1.2V, Q6 turns on and shunts the gate of Q9 thus turning off the startup timing capacitor. Q6 also turns on under short circuit conditions thus limiting short circuit current. For firing SCR2, Q4 is the firing circuit. When the voltage across the capacitor network exceeds 12V, Q1 turns on, Q2 turns on and C8 is allowed to charge –at this point, the 70uS timing period commences. Actually, SCR1 does not block until L1 is fully discharged, but it will happen after another quarter-cycle of the resonant tank elapses (16uS). This allows another 54uS to elapse before SCR2 can fire and that satisfies the turn-off time spec for SCR1 (Tq).